R-SIM 11 + 4G Unlock Card is a universal and stable iPhone * unlock tool for an affordable price. 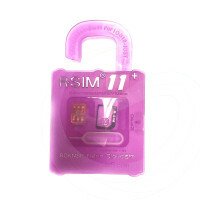 R-SIM 11 + 4G Unlock Card is universal - it unlocks different system versions. The jump menu mode is kept for foreign version phones. Locked Chinese and Vietnamese phones are supported when the R-SIM is inserted.